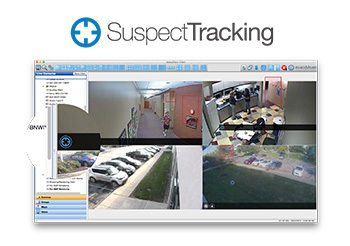 INDIANAPOLIS, September 15, 2016 — With the release of exacqVision 8.0 video management system (VMS) software, Tyco Security Products introduces suspect tracking, a new way to follow a person or object of interest through the entire scene. exacqVision version 8.0 video management system (VMS) software also includes new archiving for bookmarked video, activity timeout and camera inspection in Enterprise System Manager (ESM), a health monitoring program for use with exacqVision Enterprise network video recorders (NVRs). With the new suspect tracking feature in exacqVision version 8.0, users can track suspects through multiple camera views by drawing a transparent box in a specific area and linking that to other adjacent cameras with CameraLinks. Through exacqVision search tools, users can also create a suspect tracking search. 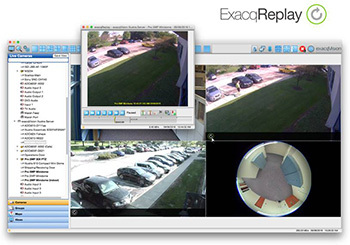 In addition to suspect tracking, operators can access exacqReplay directly from live view with CameraLinks for an instant replay of video and audio. Bookmarked video can be archived separately from other footage to create a second copy of important video. In retail applications, a corporate security officer can bookmark video of an incident at a specific store and then archive it automatically to the corporate network share overnight during off peak hours. Afterwards, exacqVision users can directly search bookmarks on the archive while not limiting WAN bandwidth. To further conserve bandwidth, exacqVision will now blank video panels when the client has been inactive for a designated amount of time. exacqVision 8.0 also allows users to configure the color and background of serial data displayed in live view to easily read associated data such as license plates and receipt transactions. Enterprise System Manager (ESM) offers camera inspection. With the web service deployed, administrators can visually compare camera views to reference images and identify and denote cameras needing adjustment. Additionally, ESM users can generate camera assessment reports to be used by technicians on site to simplify camera inspection services. exacqVision VMS now supports more than 3,000 IP camera models including cameras from Illustra, Axis Communications, Arecont Vision, Panasonic and other leading IP camera manufacturers. exacqVision 8.0 adds support for the new Illustra video intelligence analytics on the Illustra Pro mini-dome IP cameras to automatically analyze captured video and alert users of specific motion detected activities through event linking.